I have been making my own pie crust for long enough now. And let me tell you something, there is nothing better than precooking it because you do not want a soggy pie/tart! In order to prebake your crust, you can buy weights specially made for prebaking, or use beans or you can make parchment paper discs. All three methods have one thing in common: they prevent the crust from raising and you absolutely need to chose one! I have weights but I don’t have enough for when I use my mini tart/pie dishes. So here is an easy tutorial to make parchment paper discs to prevent your crust from raising while it prebakes. I recommend prebaking your crust from 15 to 20 minutes in a preheated 325 °F oven (160 °C). I would also recommend you start with 15 minutes and prolong one minute at a time until the crust start to color a little bit. 4. Fold on the diagonal, again and again or at least as much as you can. 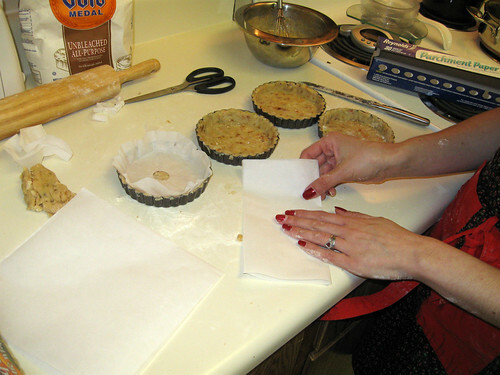 Here in this example, I use mini tart dishes so I do not have to fold so much. Then grab your scissors and cut the tip. That will be the center of your disc. The reason why you need to cut a hole in the center is to let the air circulate. 5. 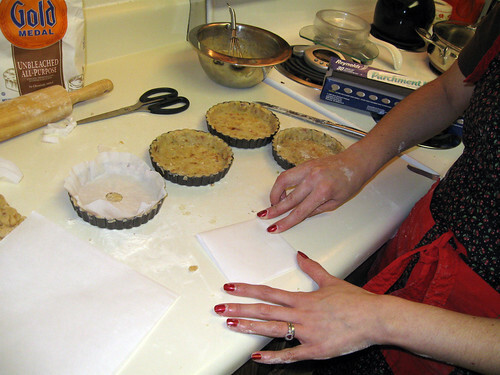 Now place your thingymaggig aka parchment disc on the radius of your pie crust and cut just at the edge. It is better to make it bigger than smaller so do not worry if it’s not perfectly perfect. 7. Now put it on your crust, insisting on the corners. Because there is a lot of butter in homemade pie crusts, it should stick just fine. You are now ready to precook them for 15/20 minutes in your 325 °F (160 °C) preheated oven. Next Post Tutorial – What to do with a pile of fancy magazines?